Mr G and I recently returned to Glasgow for a mini-break, and this time The Wee White Dug came too. We were back to discover more of what Glasgow has to offer. And what better way for outdoor enthusiasts to explore the city, than with a guided walking tour around the City Centre Mural Trail. Arriving in Glasgow at 9:30am, we completed our obligatory laps of the city’s one-way traffic system like the Grizwolds’ on vacation, before finally managing to park! We met our guide, Tom from Photo Walk Scotland outside the Gallery of Modern Art (GoMA). We’d be spending the morning with him, meandering round the City Centre Mural Trail and learning about Glasgow’s history along the way. The City Centre Mural Trail was launched by Glasgow City Council in 2014 to promote the growing number of murals appearing in the centre of Glasgow. It has its lovers and haters, but I love it. To me “art” doesn’t just adorn the walls of posh galleries. There’s room for all genres, street art included. The first stop on our tour was George Square – a grand, statue filled square fringed by imposing Georgian architecture. Stand on George Square and it soon becomes apparent just how wealthy the city became during the industrial revolution. Glasgow was the second city of the British Empire. A city of booming trade and industry, and its impressive architecture stands testament to those days. The Wee White Dug was fazed, not a jot to find himself in the middle of Scotland’s largest city. He was in his element and tore across the square eager to sniff every statue pedestal, bin and lamppost in his path. Our first artwork was ‘Hip hop marionettes’ by street artists Rogue-One and Art Pistol. It adorns the gable-end of a building on John Street and brightens up an otherwise unremarkable wall. The mural was inspired by a Beastie Boys album cover and a Photo of Run DMC. Next up was the largest piece of street art in the UK. Created by Rogue-One, Art Pistol and Ejek. Strathclyde University’s ‘Wonderwall’ celebrates the many achievements of the university’s alumni and teaching staff. It’s an amazing piece, and the longer you look at it the more you see. Our next stop was one of my favourites on the City Centre Mural Trail. ‘St Mungo’ by Smug is a beautifully, evocative mural which adds a modern-day twist to the story of St Mungo and the bird that couldn’t fly. Stand back and observe it for a while, and the attention to detail is truly staggering. From the halo of light surrounding St Mungo, to the flecks of grey in his beard and the lifelike little robin on his finger – it’s beautiful. We made our way from one mural to another, up and down lanes, taking shortcuts we’d never have found without Tom there to guide us. Wellpark Brewery – worthy of Willy Wonka! Glasgow is a city loved for its people and banter. People make Glasgow they say, and it’s true. For me, our next stop perfectly summed up the Glasgow banter and sense of humour. Tennent’s are almost as well-known for their quirky ads as they are for their lager. Arrive outside their Wellpark Brewery, and you could be forgiven for thinking that you’d just rocked up at lager’s answer to Willy Wonka’s Chocolate Factory! It’s insane – from the giant retro TV topped with lager cans outside, to the humourously decorated wall surrounding the site. One mural kept drawing me in and seemed really familiar. I stopped to snap some photos and got the boy to pose too. It turns out that the natty dude in the photos below is Sam Heughan of Outlander fame. Before Sam became known the World over as Jamie Fraser, he made a series of ads for Tennent’s! After a photo snapping frenzy at Wellpark Brewery we were on our way once more. Into the ancient heart of the city we wandered and the seven-storey, Tolbooth Steeple came into view. It was built between 1625-27 and is all that remains of a much larger building. Taking a break from murals we stopped at a fish market to snap photos. It was like stepping back in time. I used to chum (Scots for accompany) my Nana to the fishmongers regularly. She was forever dressing fish in breadcrumbs (good tea), or poaching it in butter and milk (bad tea). The boy looked hopeful, no doubt willing a fish to levitate his way. Tom claimed to know where to find some of the best scones in town, so we stopped at Cafe Source on St Andrew’s Square to put his claim to the test. This square was another Georgian gem, and it looked uncannily like Edinburgh. It turns out Tom did indeed know where to find awesome scones. We loved Cafe Source and their scones. The boy was fussed over like a rock star which pleased him no end. Caffeine and sugar levels topped up we were ready to see more of the City Centre Mural Trail. In 2017 the BBC commissioned artists to create portraits to celebrate Billy Connolly’s 75th birthday. Glasgow City Council then commissioned murals of the portraits by Jack Vettriano, John Byrne and Rachel MacLean. Rachel MacLean’s portrait depicts Billy dressed in an outfit which displays the topics he’s discussed in his comedy. Look and you’ll see tea-cosy hats and flowing nose and ear hair! Next stop, The Barras, a well-known street market, and now also home to some pretty fine street art. I loved Teddy Tunnock – a nod to a favourite Scottish biscuit and a stark reminder of the figure that can be achieved by consuming too many biscuits! Beside Teddy was a lovely mural by Rouge-One depicting a young girl dressed as a pirate. The flush on her cheek, and the way her hair tumbled over her shoulders made her look so lifelike. Looming over a car park in Osborne Street was a Rogue-One mural of John Byrne’s portrait of Billy Connolly. Next, a more recent piece by Conzo Throb which encapsulates the Glasgow humour in a nutshell. Glasgow’s traffic cone hatted Duke of Wellington statue enquires “Are ye dancin?” and opposite him a blue haired busker replies “Are ye askin?” – brilliant! Our tour ended with the first piece of Glasgow street art I ever saw. ‘Honey I shrunk the kids, I’m sorry!’ by artist Smug is a fun piece. Strategically place a human beneath the giant, and countless photo opportunities await! Mr G was displaying signs of hanger. He’d become quiet (he only stops talking when he’s sleeping or hangry) and withdrawn. Soon he’d be girning about food. With a lunch reservation waiting, we said goodbye to our fabulous tour guide Tom, dropped our car off at our accommodation, and jumped in a taxi to Glasgow Green. After pounding Glasgow’s pavements we were looking forward to relaxing over lunch at WEST. WEST is an independent microbrewery which was founded in 2006. Brewing lagers and wheat beers, their ethos is “Glaswegian heart, German head”. One of my favourite lunch venues is a tiny trattoria in Venice, so you can imagine my surprise when our taxi pulled up outside the Doge’s Palace. Or Glasgow’s answer to it – The Templeton Building. Completed in 1892 the building once housed Templeton’s Carpet Factory. Commissioned by factory owner James Templeton, it was designed by architect William Leiper. Due to the factory’s proximity to Glasgow Green the building needed to enhance the area, not blight it. Leiper’s design was heavily influenced by Venice’s Doge’s Palace, but it also drew inspiration from the Oriental carpets the factory produced. I think Leiper came up with a design suitably fantoosh to grace the fringes of Glasgow Green. The perfect lunch to stave off hanger! With his hanger reaching fever pitch Mr G wasn’t for hanging around to discuss architecture. He shot inside WEST like he hadn’t eaten in a week. Inside, subdued lighting and a simple, no fuss interior made WEST the type of place where I feel instantly relaxed. As we were on a city break we went all Continental and had wine and beer for lunch – we’d earned it! We ate a tasty, but unconventional lunch (driven by our eclectic taste and not the menu). We both started with potato and leek soup which was a winner. Next came skinny fries – mine with peppercorn sauce and Mr G’s with curry. Sometimes a bowl of chips and dipping sauce is all you need. I went all out adventurous and finished with some cinnamon ice cream, while Mr G played it safe with chocolate, strawberry and vanilla. I’d love to have lingered longer, but sadly we had to leave. Outside, I spotted a sitooterie (Scots for outside seating area). I decided that the next time I found myself in Glasgow with a terrible thirst, and the sun beating down I’d head straight to WEST! It’d been a busy day, and we were in need of some chill time before dinner, so we jumped in a taxi and headed to the West End of Glasgow. Our accommodation for the night was 15Glasgow, a luxury boutique B&B. Located in an A-listed Victorian townhouse in the leafy West End. It felt like it was a million miles away from the hustle and bustle of the city centre. We were welcomed by owner Lorraine and shown to our room – the Charles Rennie Macintosh Suite. Wow – it was absolutely stunning. With a super king size bed, and giant corner sofa we had lots of space to relax. It was beautifully decorated, in a Charles Rennie Macintosh theme. Ornate cornice, high ceilings and three huge windows overlooking mature gardens gave the room a light and airy feel – it was a tranquil haven in a busy city. The boy quickly settled in and made himself at home. A short rest and shower later, we were togged up in tweed and ready for dinner at a local eatery. After a busy day we were looking for a chilled evening. Luckily we had a reservation at The Drake, a stone throw from our swanky West End digs. The Drake is the perfect place to enjoy dinner, a couple of drinks, and quiet conversation in relaxed surroundings. Inside, spotting some Harris Tweed chair coverings, I quickly removed my jacket before I blended into my surroundings like a chameleon! Wine and beer in hand we chatted about our day as we waited for our food to arrive. We started with soup – what else? A tasty, Tomato & chilli soup, with marscapone & pesto to be precise. For main we opted for chestnut mushroom risotto, parmesan rocket salad & white truffle oil. Soup AND rice, I was in my element. It was lovely but filling, and that should have been my cue to stop eating, but I soldiered on and ordered pudding. The vanilla meringue, white chocolate and passion fruit sank me without a trace. It was time to waddle back to 15Glasgow to sleep off my feast. Back in our beautiful room we were soon fast asleep. The next morning we woke early feeling refreshed, and ready for the day ahead. We enjoyed a lovely breakfast, sitting by the window in our room and wished we could stay longer. Glasgow the perfect city break destination? Glasgow is the perfect city break destination. It has so much to offer – culture, food, shopping, live music and lots of green space. They don’t call it the dear green place for nothing. 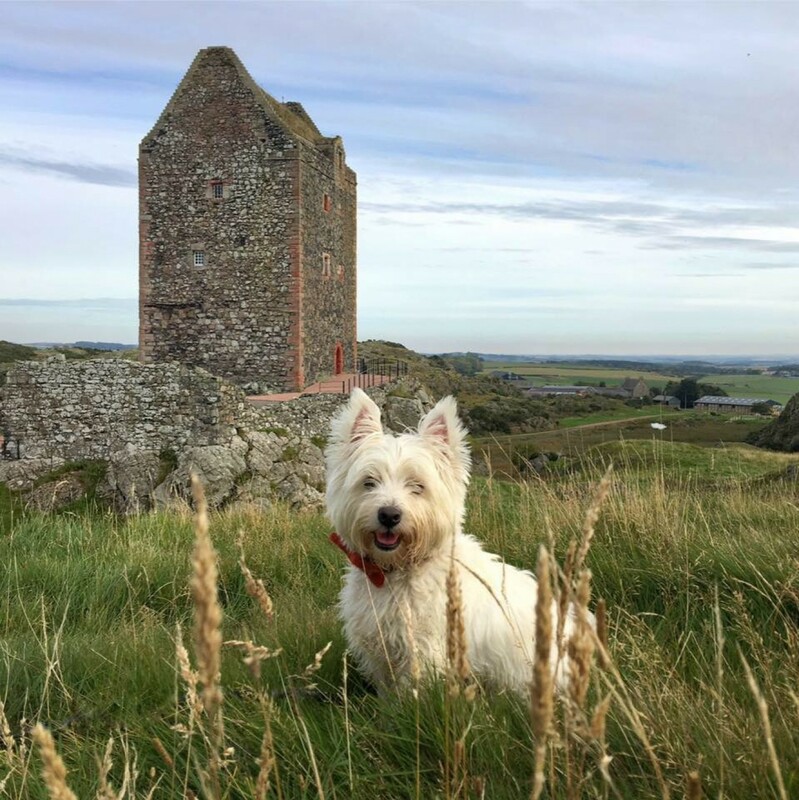 It’s ideal for families, couples, friends and travellers with and without four-legged friends in tow. Glasgow has something for everyone. For further information on booking your trip to Glasgow visit www.peoplemakeglasgow.com. Thanks to the team at Glasgow Life for inviting us to Glasgow and organising our fun packed itinerary. Although our tour of the City Centre Mural Trail, food and accommodation were provided on a complimentary basis all opinions contained within this post are entirely my own. These are amazing!!! That pirate girl is just mindblowing. I love street art, so I’m gonna have to seek these out next time I’m in Glasgow town! I’ve only seen a couple of them before so lots to find! I absolutely LOVE Glasgow. It never fails to surprise me and make me fall even more in love with it (if that’s possible). It is true, People make Glasgow. The mural trail is a great way of exploring the city and I think I need to get myself back over there! Thanks Mel. I’ve always loved Glasgow too and have a ball whenever I visit. I fell in love with street art in Paris so it’s lovely to see it becoming popular in Glasgow too. Wonderful post, Samantha. I have not yet visited Glasgow. I didn’t know the city boasts such splendid street art. Enjoyed your tour. Brilliant article Sam. You were absolutely born to do this! Marvelous, as always. It must have been a struggle to cut them down! Have a great rest of the week….and thanks! Thanks Liz, it’s a great way to discover Glasgow. The murals are beautiful and some of the detail is staggering considering the scale. It’ll was a lovely trip. You’ve taken some gorgeous photos. So many of these murals were only painted after I moved away from Glasgow, and it would be great to come back and see them all. Manchester’s Northern Quarter also has a collection of murals. Also loving the Mackintosh style chairs. Looking forward to seeing what Glasgow has on offer for his 150th birthday this year. Stay tuned as I’ve been invited back for the 150th birthday celebrations. The murals are wonderful and worth a trip back to see. I love street art. Paris has been embracing it for years and it’s great to see other cities catching up. After 20 years of living in Kent, I’m ashamed to say that I don’t get back to my home city enough.. People definitely make Glasgow..
There’s more art for you to see next time you’re in the city. It’s a great city to meander around.